Preheat oven to 350 degrees F. Butter and flour a 9-inch loaf pan. In a medium bowl, sift together flour, baking powder, baking soda and salt; whisk in chocolate and peanut butter chips until combined. In a large mixing bowl, using a mixer on medium speed, beat together banana and peanut butter until creamy, about 1 minute; beat in granulated sugar and brown sugar until creamy, about 1 minute. Beat in eggs and vanilla until combined. Reduce mixer speed to low and gradually beat in flour mixture, alternating with milk, until well combined - about 2 minutes. Divide half of the batter into medium bowl; sift in cocoa powder, and beat until combined. Alternate spoonfuls of banana batter and chocolate batter into the pan. When all the batter is in the pan, swirl a knife sparingly through the batters to marble them. Sprinkle with additional chocolate and peanut butter chips, if desired. Bake for 60-65 minutes or until bread pulls away from pan, is well risen, deep golden brown, and a toothpick inserted comes out with moist crumbs attached. Cool on a wire rack for 1 hour; run a knife around outer edges and invert onto wire rack to cool completely before slicing. 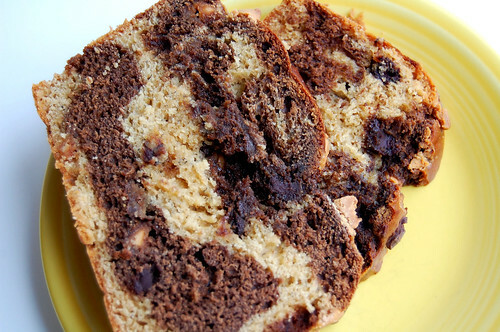 52 comments on "Chocolate-Peanut Butter-Marbled Banana Bread"
Oh, I think I'll try this one for real, it has everything I love in it! AHHHHH!!!!!! I hope to NEVER find a rodent like that - eek!! 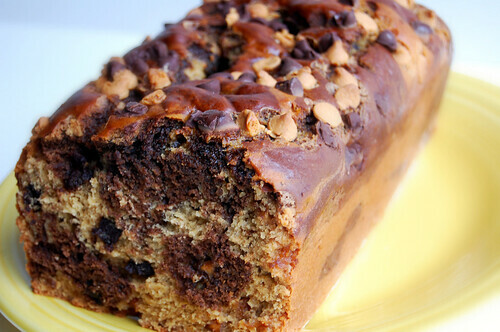 On a happier (and more delicious) note, I'm loving that chocolate-peanut butter-banana bread. STELLAR flavor combination! LOL kiddie combo at the movies. can't I haven't done that, but I might next time. we have or should I say had a ton of mice, my cat is good at keeping them at bay. do you have a cat? even the scent of a cat scares mice away. And what a fun post. I was happy to read about the mouse and New Moon, but throwing those pictures in there in between? Over and over? That was a little bit of torture. I am DEFINITELY making this. Oh, and I made your white chocolate cream cheese cranberry crumb cake (sorry I'm guessing on the name. .. )and it was delicious. Especially when it was completely cooled and you could really feel the contrast of the filling. Mmmm. Emily, this recipe may just make its way to our SPCA Bake Sale on 12/14! I think it would be a huge hit in little loaf pans. Thanks for the awesome idea! It looks incredibly delicious Emily and nothing scary about bananas. Looks like you have a weemousie visiting for the holidays...he is very social and will bring his friends. Bread looks amazing. 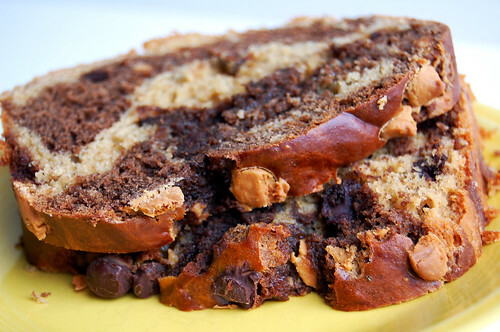 Banana chocolate and peanut butter - one of the best combos ever! My roomies cat found a mouse once... not so much fun!! As for the mouse, when I moved to my new apartment, we had visitors... Mice. Eeeekkk... Peanut butter did not work, but we caught the whole family in a day with... chocolate chips. Guess the mice family was a chocoholic too! Oh no, a mouse!? Ewww, that is creepy. Glad you liked New Moon. I agree...it was much better than the first one. This bread looks amazing! I wish you were my neighbor, so you could bring me some. All my favorite things in one place, I cannot wait to try this recipe out. I am not into the whole Twilight scene, but glad you enjoyed it! I always get the kiddie combo at the theatre--smaller portions/price=perfect! This bread looks like it would be highly addictiing..which is why I may need to make it next week to get me through finals ha ha. Eww at that mouse. They seem cute at first, until you realize where it could be! I had one also, and wouldn't use any of my pots and pans in my cabinets until I knew the little sucker was dead. Oh and this bread looks killer, it has all my favorite flavors, marbled in one! I'm deathly afraid of rats! Just seeing one on a movied causes me to shudder. I saw New Moon. Loved it a lot more than Twilight. Most everyone is saying that. I guess more Jacob was a good thing! Chocolate, peanut butter & banana...looks delicious! Yeah! You finally saw New Moon! I love it tooo! Now you can read my review! This looks good, I may try to make it! I'm a total nut when it comes to banana bread....my favorite! I will have to try this. 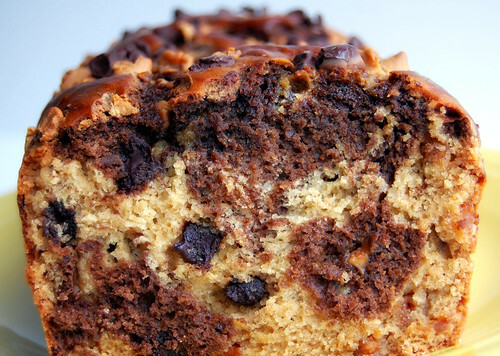 It looks terrific, especially with the addition of chocolate. I love New Moon and have seen it twice! yummmmmm. all my favorite flavors!!! hope you guys catch the little critter!! I hope the mouse doesn't get inside the wall and die there because the smell is something horrible. this is totally calling out to me... my fav flavors :) i can't believe you caught a picture of the mouse! hope you catch him, soon!! Love the new softer layout and I would kill for a piece of that delicious bread!!! I would have done exactly the same thing!!! Take a picture of the dear little critter...before getting someone else to murder him. That IS so creepy to have a beast loose in your house. I really feel for you. What an awesome banana bread. Maybe you should extend your credentials to be head of Banana Bread University along with the Brownie one you already lead. You've totally outdone yourself with this recipe - your bread looks absolutely fantastic! Talk about the ultimate banana bread! Good luck with the mouse! Found your blog yesterday, via cakespy's links, when i have some downtime i always checkout blog links, your site is wonderful, just pulled out from the oven the pumpkin foccacia, it looks incredible and tastes great! sorry didn't wait for it to cool, my kids are so excited, we love all things pumpkin here. i added a bit of oil olive to the dough and subbed pecans as i didn't have walnuts and used 1/2 bread flour and doubled the recipe as i wanted a super mega size loaf, going to use it for turkey sandwiches along with a tomato soup, can't wait for dinner,I'm so excited to find pom recipes as well, the chocolate dipped shortbread looks like christmas on a plate!Re; your mouse inthe house, we lived thru an infestation, only problem the children thought they were pets at the time! i ended up chasing one critter with it tails caught in a trap, not a happy memory no wonder we moved shortly after! good luck. My niece would love your mouse. She's convinced an entire family of mice live in her house and have adventures. Cute little sucker, but you don't want them in the house chewing everything and poopin in things. They do make humane traps where you can release them outside, but you just have to make sure home entrances are well sealed or the mice keep coming back. I want your bread big time. That looks really good. I am not a fan of rodents. Eww! I am a fan of this bread though. Slice a piece for me! After loving your banana bread recipe from last May, I am super excited to try this one soon! For Thanksgiving celebrations this year I even made that banana bread again, but I substituted pumpkin pecan butter for the peanut butter. It was a huge hit! I love your new lay out! That loaf of bread is beautiful! You are adorable. It is just a mouse! Hopefully you do catch it, though. I have chinchilla and he has gotten loose once or twice. Thankfully the cat just thinks he is a friend, so it hasn't been bad. I didn't like Twilight either, but I do love the books, so maybe New Moon will be good. From what I have heard, it is great. The bread looks phenomenal by the way! Looks so tempting. I've been meaning to bake some banana nut bread. Finally got around to making some zucchini the other day. Mmmm. This bread would make a perfect after work snack - yum! I hate mice too - even when they're dead, I hate emptying the traps. Fruit snacks eh - we need a kiddy combo like that here. Ours are always popcorn, choc top and a Coke. I was wondering if you had a good cheesecake brownie recipe...I've been really craving cheesecake and brownies for two days now so I am looking for a recipe! Haha you are funny. This is probably one of the best looking breads I have ever seen, not even kidding! I have 5 bananas in my freezer and I will totally be making this! It looks absolutely yummy!! Oooooh yeah - I just so happen to have some bananas in the freezer, and was wondering what to do with some pb chips in my pantry. Your bread is perfect - yum!! Oh, Emily I'm afraid for you. I HATE mice. No, seriously, NO WAY could I stay there until it was gone as in died and never to return. I'd hang it out front so all of its little mice buddies know not to mess with my house. I hate mice. Your bread sounds good. I really hate mice. Thanks for the New Moon review. I hate mice. I read the books and want to see the movie. That is some seriously good looking bread. I picked up my peanut butter chips today. And yikes about your mouse. Be glad it's not a field rat. Sue, BBU has already been created. I'm now accepting applicants. Lisaway, I'm glad you liked it. And thank you so much! Sorry about the pictures. :/ Haha. Welcome Rosemary. Thank you for dropping by! I love that focaccia recipe. Beth, that sounds delicious. I'm glad you liked the recipe. I think I like this one better! Emmanuelle, yes I did. I hope they sent your POM to you. Email me if they didn't. The pictures are gone! :( They're good though. 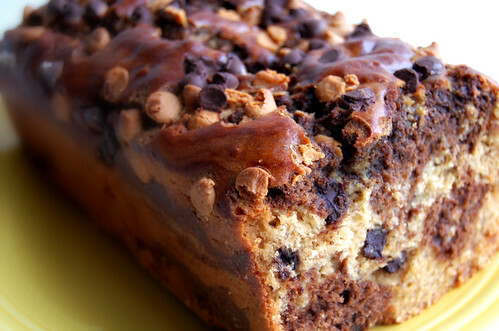 This marble banana bread looks absolutely scrumptious and so moist. I would love to try this recipe if you don't mind. Great pictures. We had mice in our old apartment a few times and it was so gross! I absolutely hated it! On the other hand, this loaf looks and sounds amazing!! 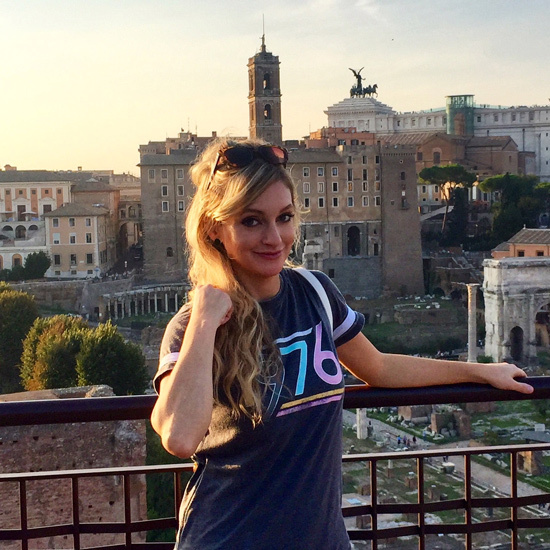 Hi I found your blog through Stephchows! I'm making this pb banana bread right now and it smells amazing! Thanks for the great idea. I wanted to make something a little different from the classic banana bread and my husband has been hinting for me to use the peanut butter chips that I bought on a whim. Hopefully it tastes as good as it smells. I was a little concerned with the high volume of batter, but it seems to be staying in the pan alright. : ) Thanks again. Hi Leah, thanks for stopping by. How did the bread turn out? The batter was REALLY thick. My hand mixer couldn't handle it and it was too late to throw it in the stand mixer. So a heads up to everyone else. Use a stand mixer especially when adding the cocoa powder. Thanks for the recipe Emily! I made it yesterday and my boyfriend and I loved it!